In the previous tutorial, we prepared all the necessary configurations to be able to build API add new question: an object containing all the information of a question CompositeQuestion, including a Question, a Category, and an Option; a CompositeQuestionService interface with CompositeQuestionServiceImpl implementation is responsible for handling the Composite Question Service, an ApiQuestionController that defines the APIs for API Question Service will start with a “/question” and information about the Composite Question Service is configured in the application.properties file. Now, let’s build this API! 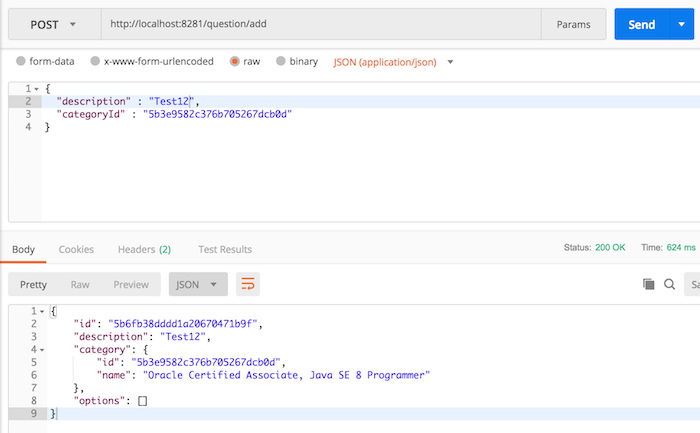 As you can see, here I have used the WebClient object to connect to the Composite Question Service and call the API add a new question of this service with the “/question/add” URI. At this point, we have completed the API to add new question for API Question Service. Let’s try it.